"This picture book is one in a gazillion." --Jane O'Connor, the New York Times-bestselling author of the Fancy Nancy series Did you know that the earth is covered in three trillion trees? And that seven billion people weigh about the same as ten quadrillion ants? Our world is full of constantly changing numbers, from a hundred billion trillion stars in space to thirty-seven billion rabbits on Earth. Can you imagine that many of anything? 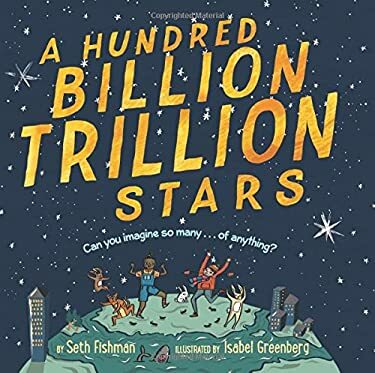 The playful illustrations from New York Times-bestselling artist Isabel Greenberg and the friendly, straightforward voice of author Seth Fishman illuminate some of the biggest numbers in the universe--a hundred billion trillion stars--and the smallest--one unique and special YOU. Here is a book for story time, for science time, for math time, for bedtime, and all the times in between. Perfect for curious children, classrooms eager for STEM content, and readers who have devoured Ada Twist, Scientist and How Much Is a Million? New (479 available) BRAND NEW. Over 1.5 million happy customers. 100% money-back guarantee. Make your purchase count: support Better World Books' worldwide literacy partners.